WWT - My damn wrestling gifs/pictures and recaps blog! Check out the most popular images of 2015 on Wrestling With Text (according to imgur and tumblr). May we have fewer injuries in 2016. 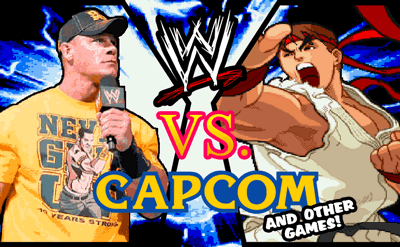 To check out my new (and old) video game/wrestling mashups, click the image below! I have added a giffing guide. First draft, please hollar at me if you're confused or need some more info. Just got put on a new server in part so I could more easily do live recaps. Also did a ton of code updates that you shouldn't notice, so hollar if anything is broken! As you may have already seen, my top priority is live giffing PPV's, live giffing RAW and recapping PPVs. There may be other stuff sprinkled here and there, but for now those are a solid part of my schedule. You may have noticed the "Lite Version" link. It switches the site into a mode which will allow you to browse recaps one image at a time. It's nice for phones or slower computers that can't load a lot of gifs at one time. If you have any issues with this or anything else on the site make sure to contact me!